Bostons rich and powerful once lived and still live on Beacon Hill. An area located behind the State Capitol, it is close to the city centre, as well as to the political power base of the Commonwealth of Massachusetts. Stately 18th century town houses, some with small front gardens, are found along streets as Mount Vernon and Beacon Street. In some of the side streets you find smaller servants quarters. One of these is Acorn Street. When the row houses here were built, Beacon Hill had fewer and larger estates. They were built in the grounds of these large properties giving easy access for domestic servants and tradesmen. Acorn street was one of these servants quarters with smaller versions of the stately homes in the nearby Chestnut street. Close by, Branch street, was once known as Kitchen street, as here you found the kitchens adjacent to the stately homes in neigbouring Chestnut and Beacon street. Workers and servants have left the wealthy Beacon Hill area long ago. Now even these houses belongs to the wealthy upper and middle class in Boston. 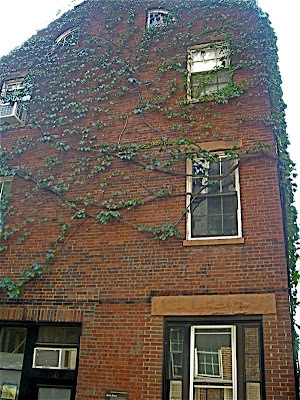 Acorn street does, however, provide a unique glimpse into once was an early 18th century class society. It is now is a beautiful quiet street in the middle of the metropolis.